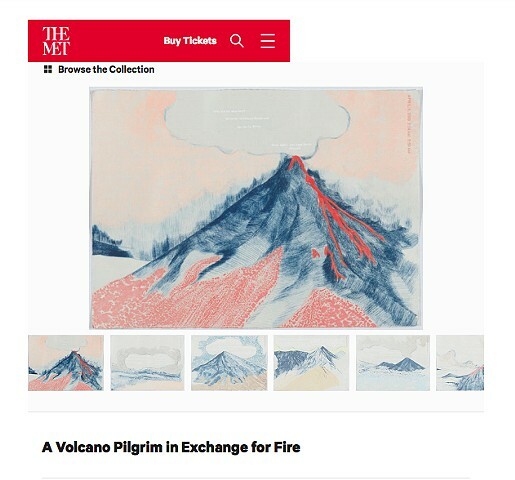 Link to A Volcano Pilgrim in Exchange for Fire, permanent collection, the Metropolitan Museum of Art, New York. 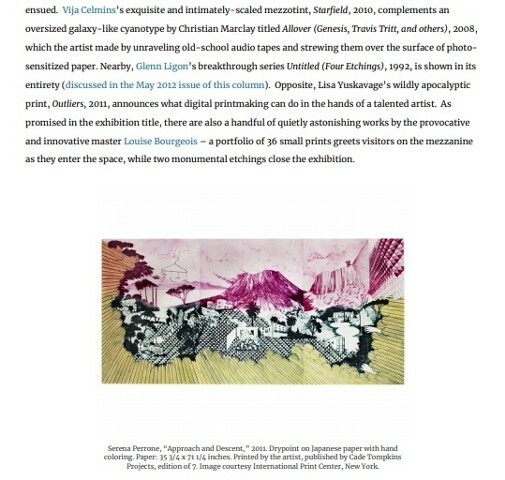 Anne Cross reviews solo exhibition Fata Morgana at the Print Center, 2017. 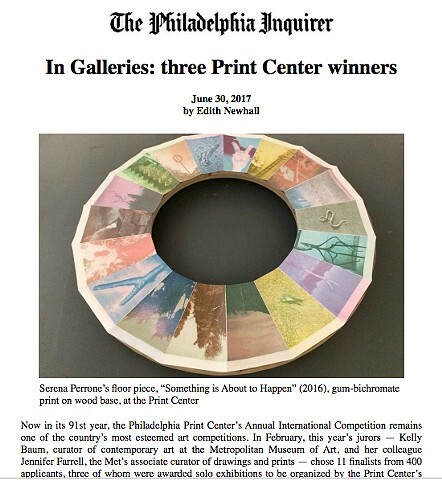 Edith Newhall reviews solo exhibition Fata Morgana at the Print Center, 2017. 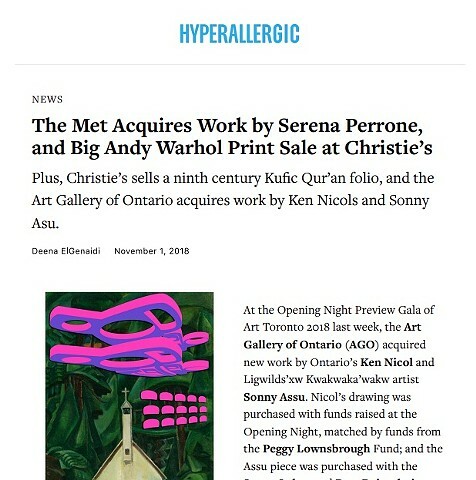 The Met Acquires Work by Serena Perrone, and Big Andy Warhol Print Sale at Christie's. 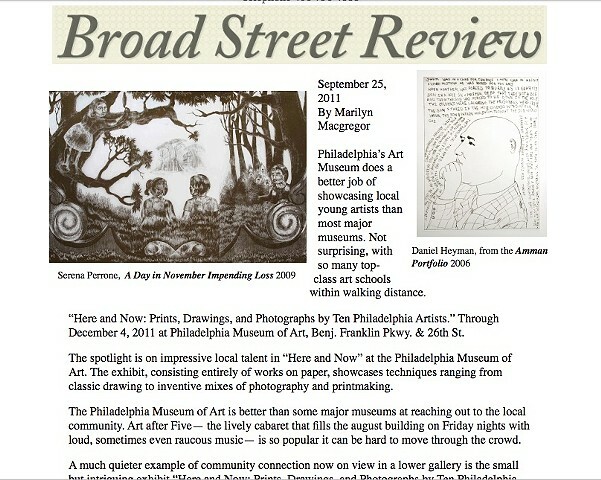 Daniel Gerwin reviews Here and Now at the Philadelphia Museum of Art, 2012.
Review of exhibition selected by Kara Walker at the Providence Art Club, 2006. 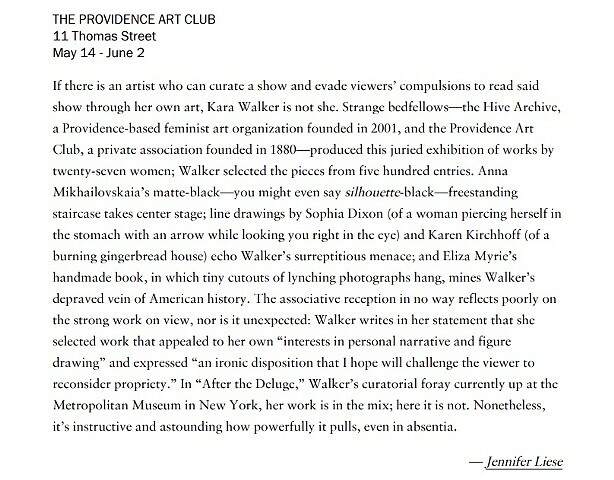 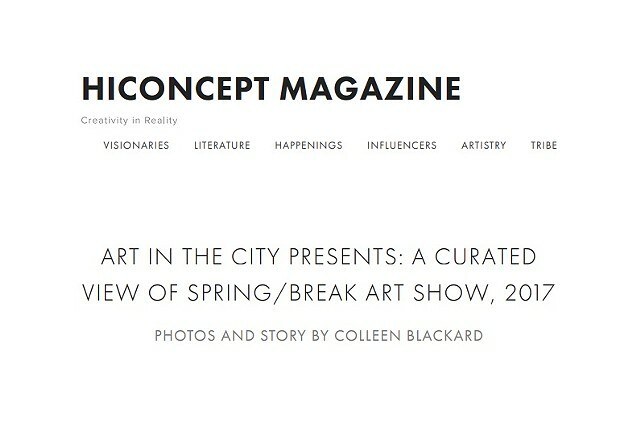 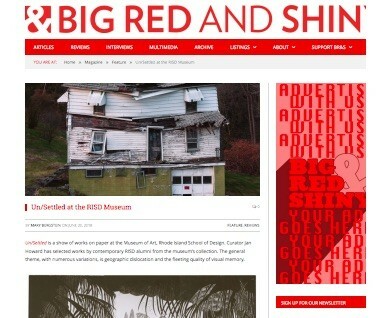 Kelly Schindler's curatorial essay for solo show, 2012. 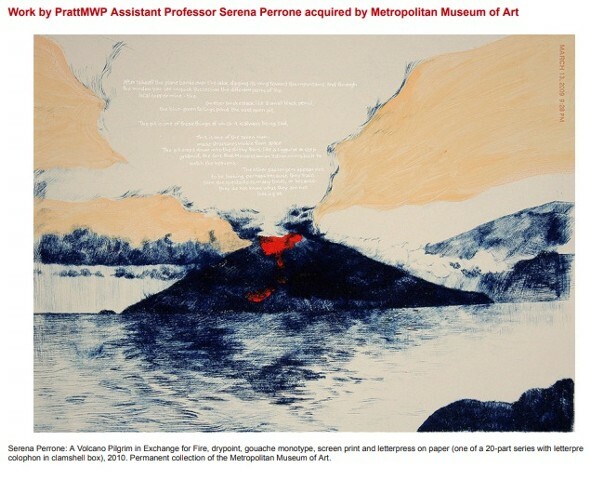 Work by PrattMWP Assistant Professor Serena Perrone acquired by Metropolitan Museum of Art. 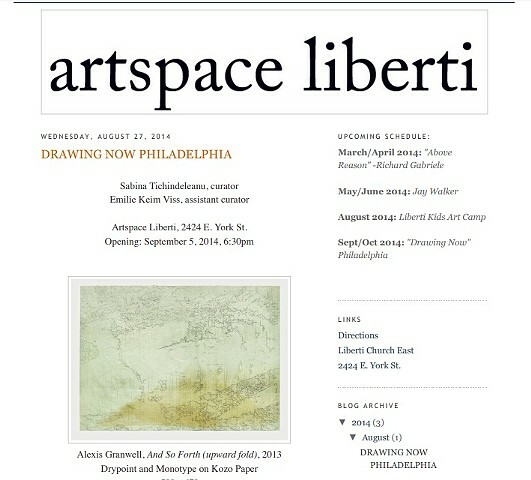 Sarah Kirk Hanley reviews Alberi: Site Specific. 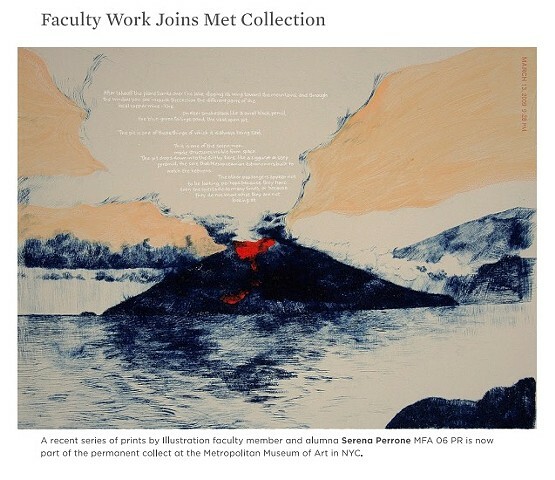 Faculty work joins Met collection. 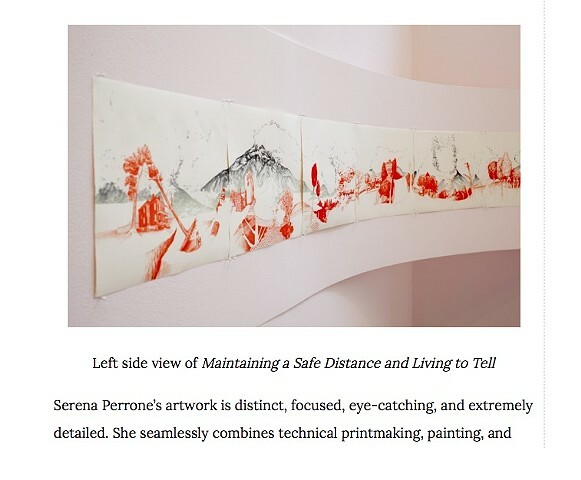 Review of Contemporary Drawings at Cade Tompkins Projects, 2018. 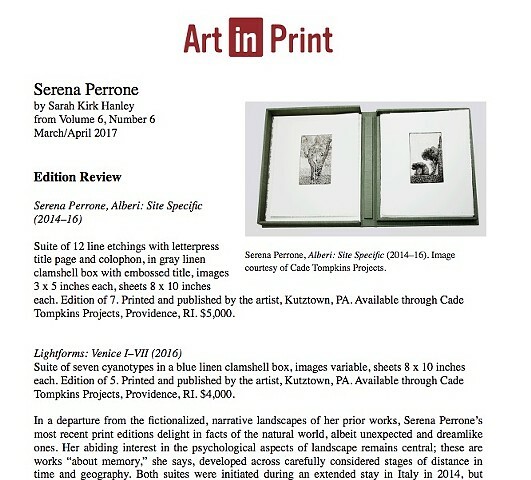 Exhibition catalog by Andrea Packard for 2013 solo exhibition at Swarthmore College's List Gallery. 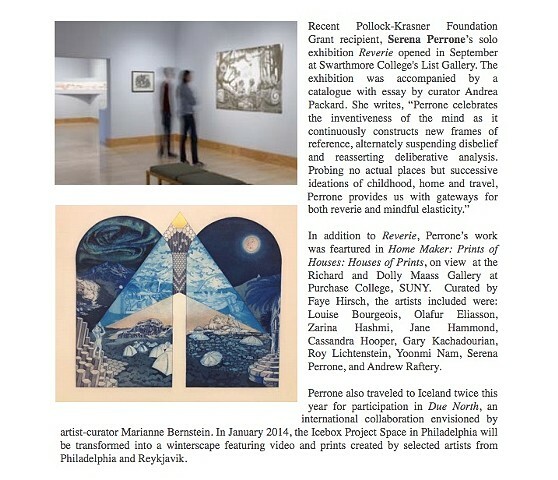 Edith Newhall reviews solo exhibition "Reverie" at Swarthmore's List Gallery, 2013. 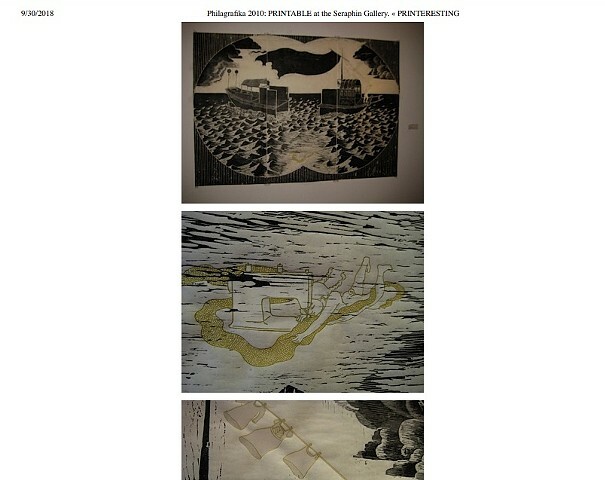 Sarah Kirk Hanley features Approach and Descent in Ink: Notes on the Contemporary Print, 2012. 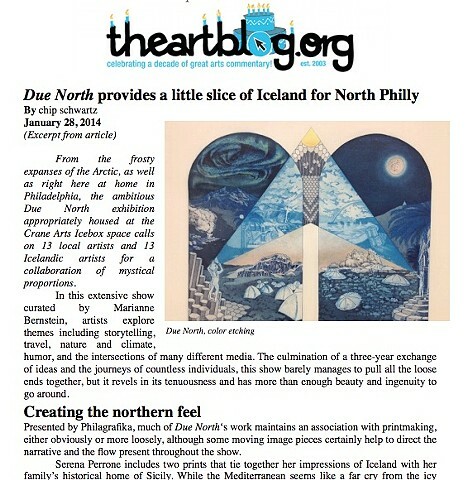 Featuring Fata Morgana/Mondo Nuovo at Spring/Break Art Show, 2017.
Review of Due North, 2014. 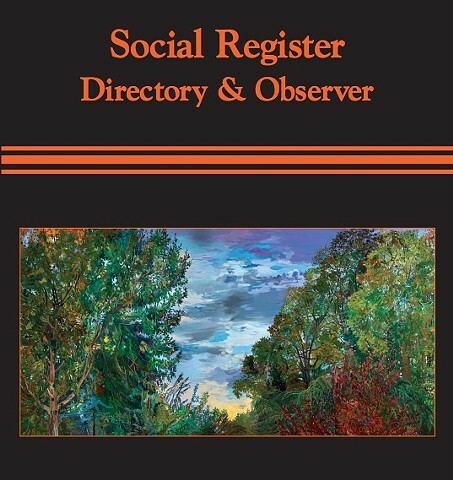 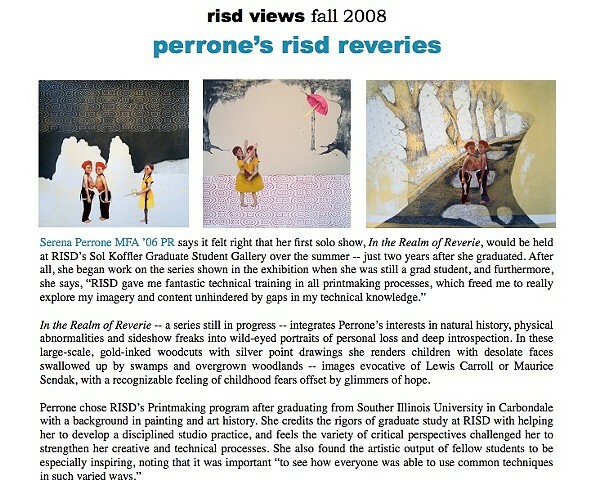 Reverie at List Gallery; Faye Hirsch show at SUNY Purchase; Due North. 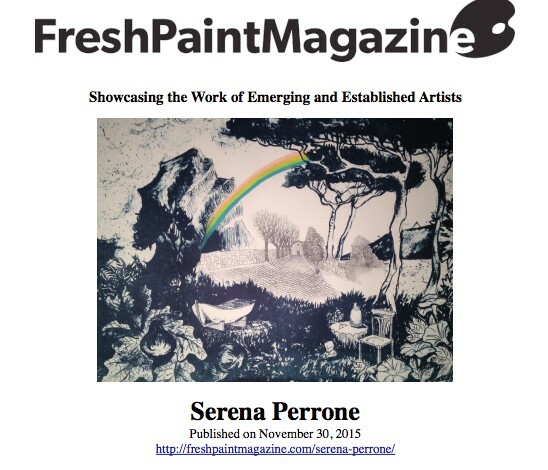 Fresh Paint Magazine features my work. 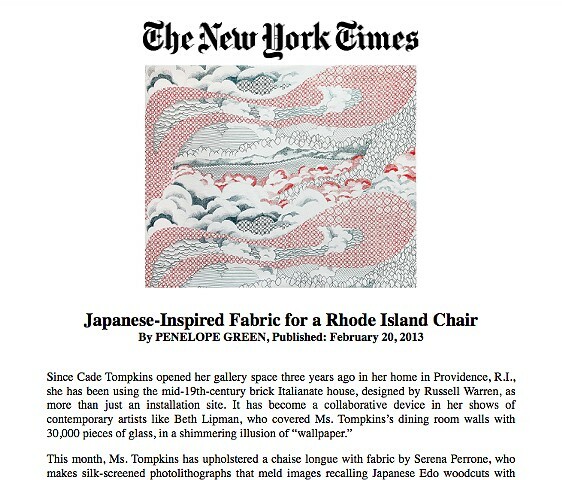 New York Times Magazine features textile printing project, Biwa. 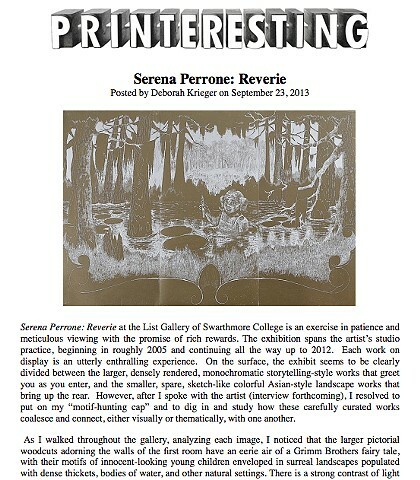 Deborah Krieger reviews solo exhibition, "Reverie" at Swarthmore's List Gallery, 2013.
Review of On Loan at Tiger Strikes Asteroid, 2012. 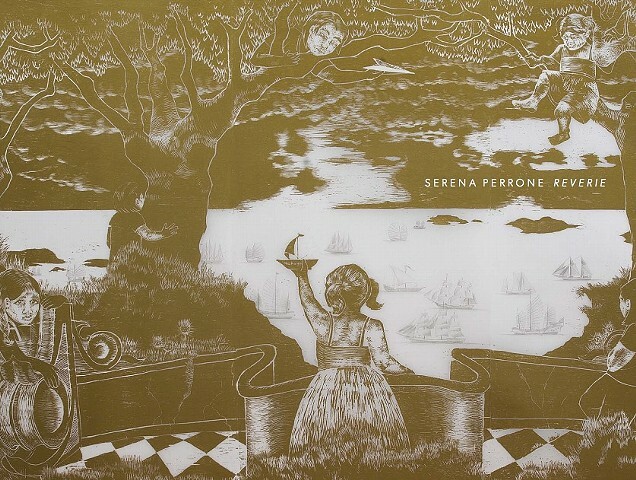 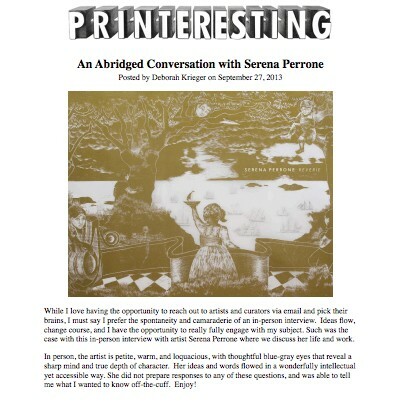 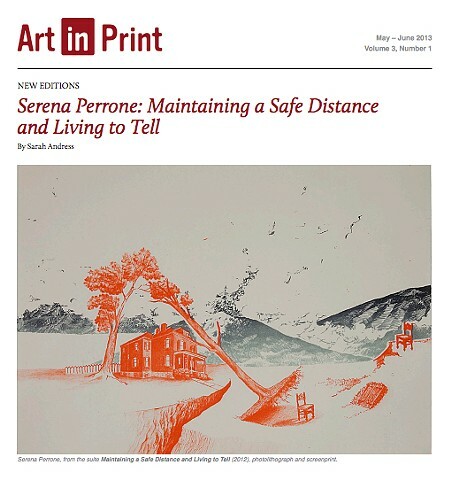 Deborah Krieger interviews Serena Perrone for Printeresting, 2013. 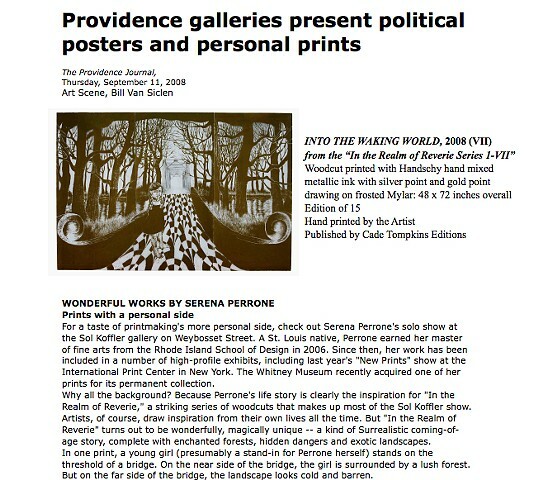 Bill Van Sicklen reviews solo exhibition at Sol Koffler Gallery, RISD. 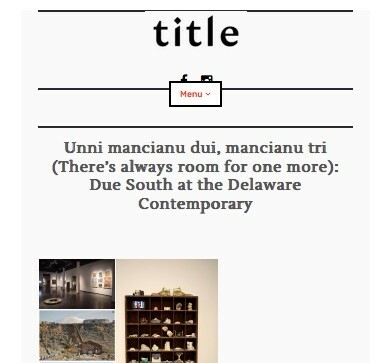 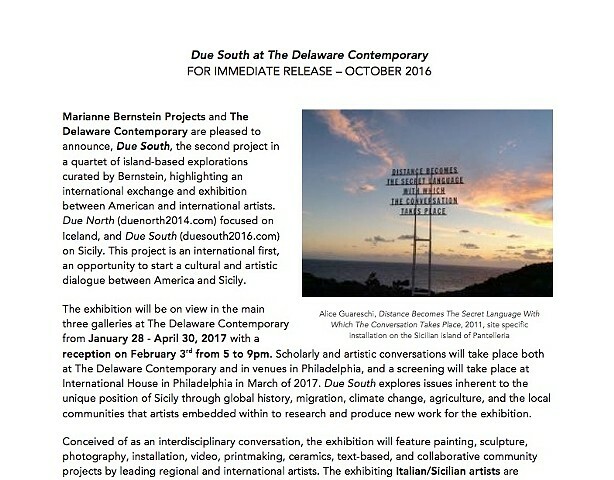 Due South at the Delaware Contemporary, 2017. 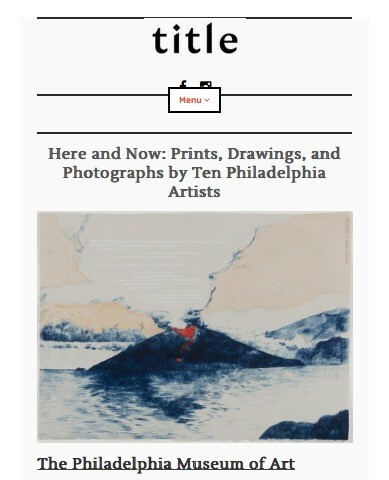 Printeresting highlights A Volcano Pilgrim in Exchange for Fire and Maintaining a Safe Distance and Living to Tell, on exhibit with Cade Tompkins Projects at the Editions/Artists' Book Fair, New York. 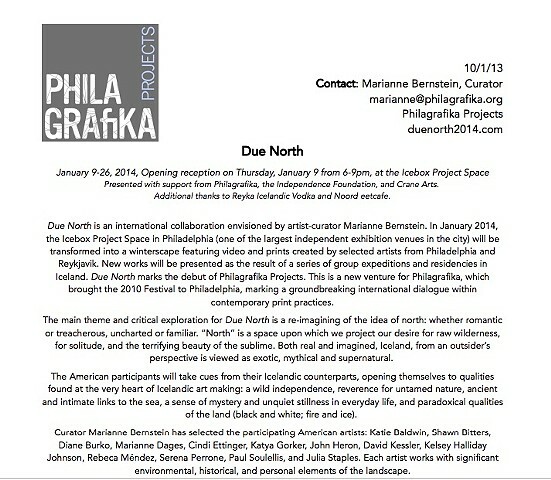 Due North press release, 2014. 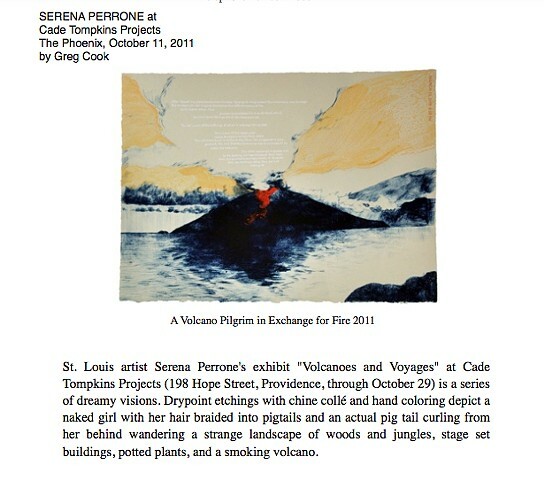 Renee Doucette reviews solo exhibition Volcanoes and Voyages at Cade Tompkins Projects, 2011. 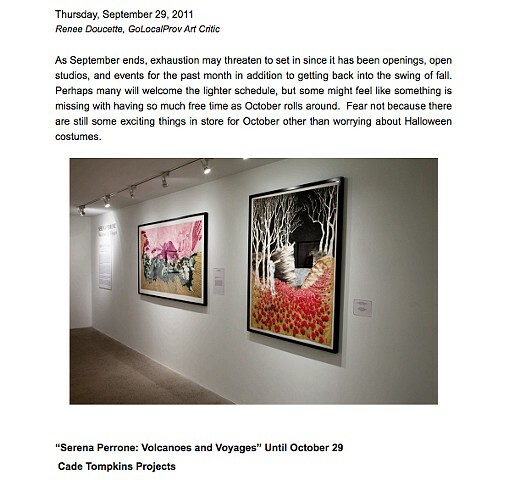 Greg Cook reviews solo exhibition Volcanoes and Voyages at Cade Tompkins Projects. 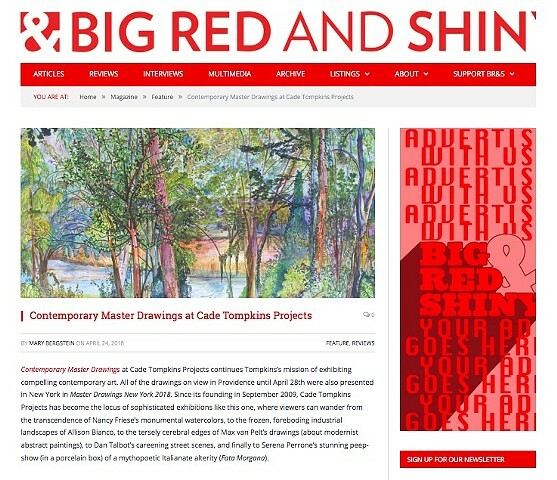 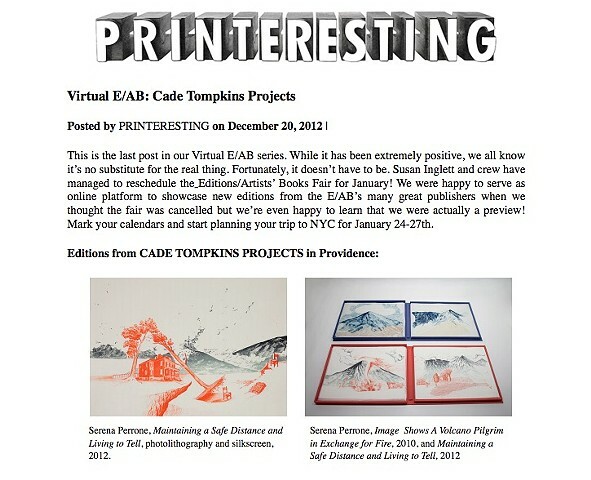 IFPDA member and fine art print dealer Cade Tompkins writes The Joy of Collecting Fine Art Prints. 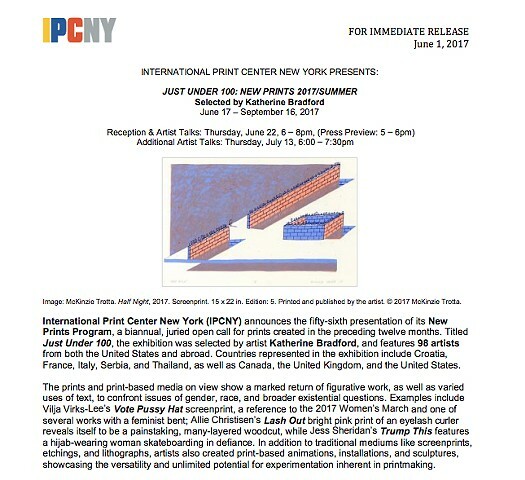 New Prints/Summer 2017, selected by Katherine Bradford. 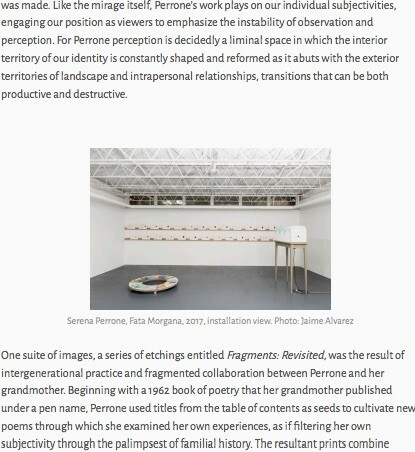 Mary Bergstein reviews Un/Settled at RISD Museum, 2018. 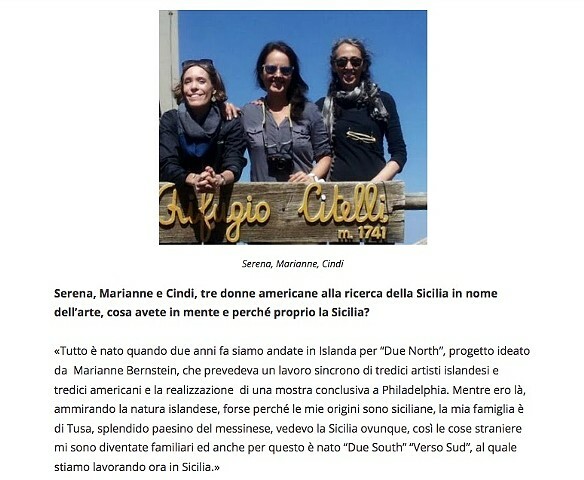 Interview with Alessandra Fasari for Sicilia e Donna magazine. 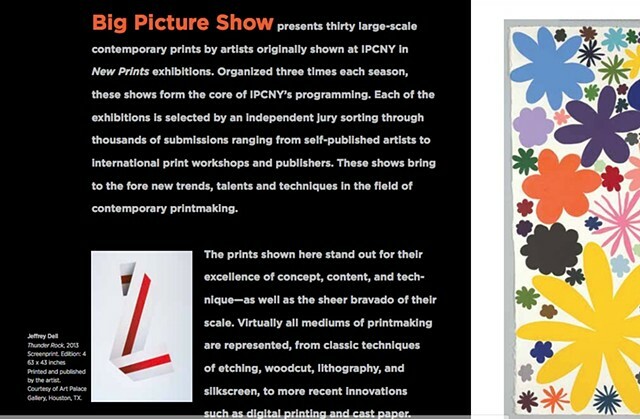 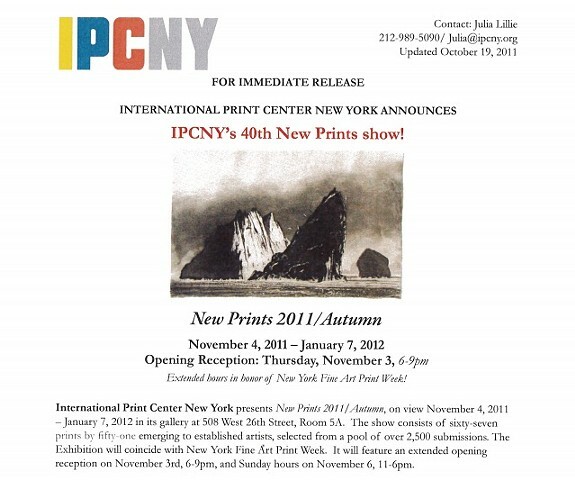 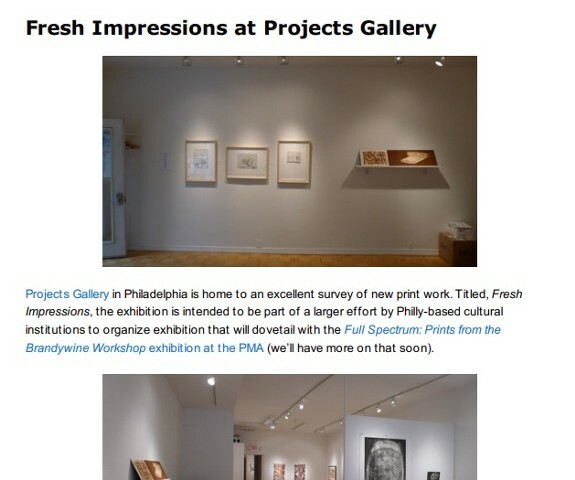 Printeresting review of Fresh Impressions at Projects Gallery. 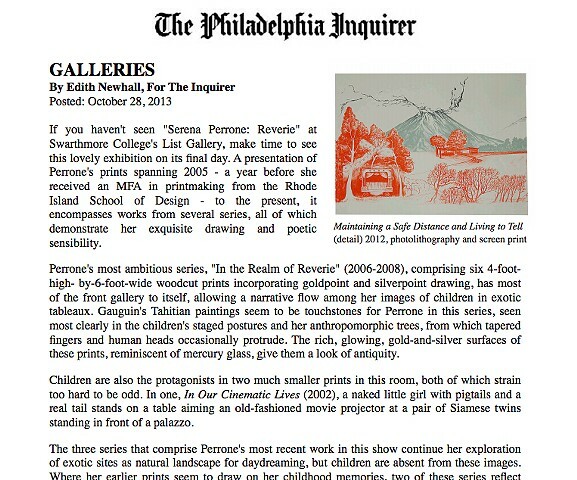 Review of Philagrafika-affiliated exhibition Printable at Seraphin Gallery, 2010. 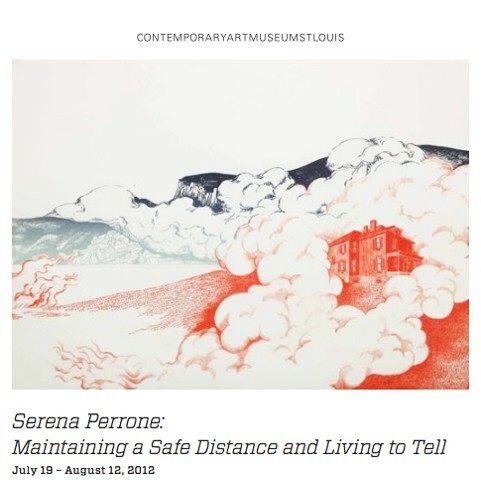 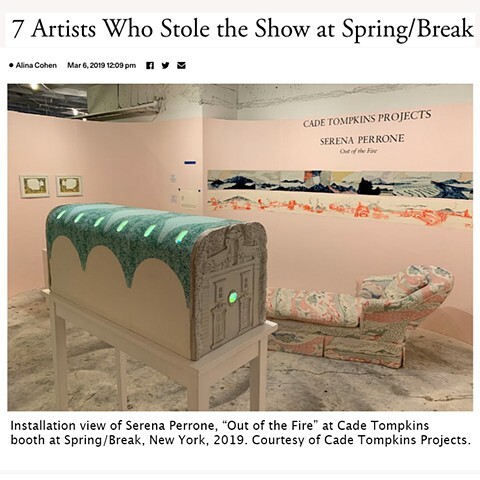 Serena Perrone interviewed by Emily Frankoski. 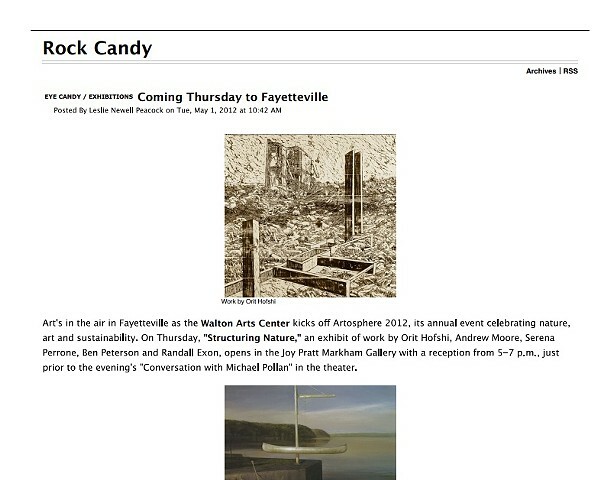 Structuring Nature exhibition in Fayetteville, 2012. 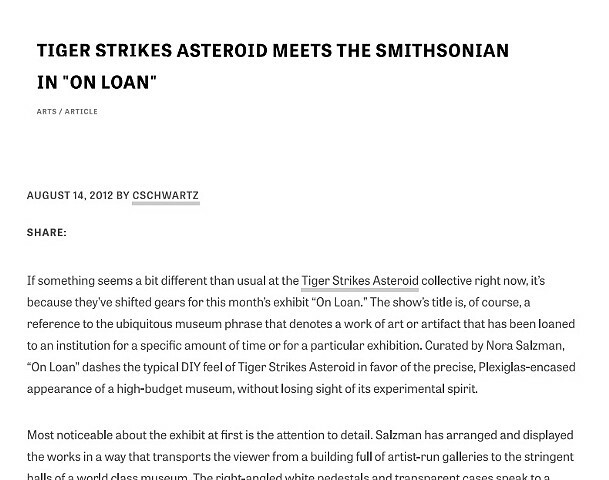 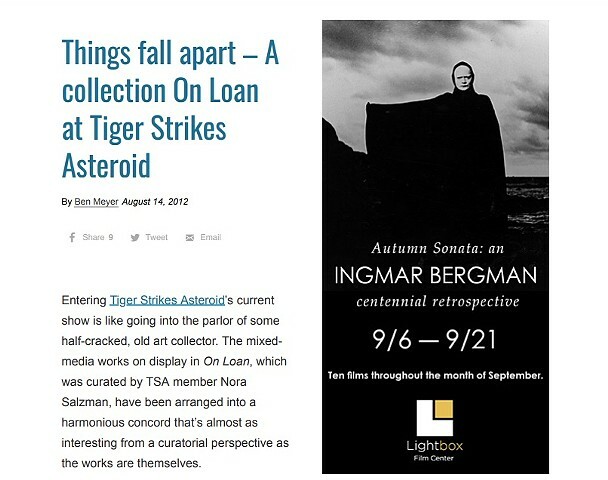 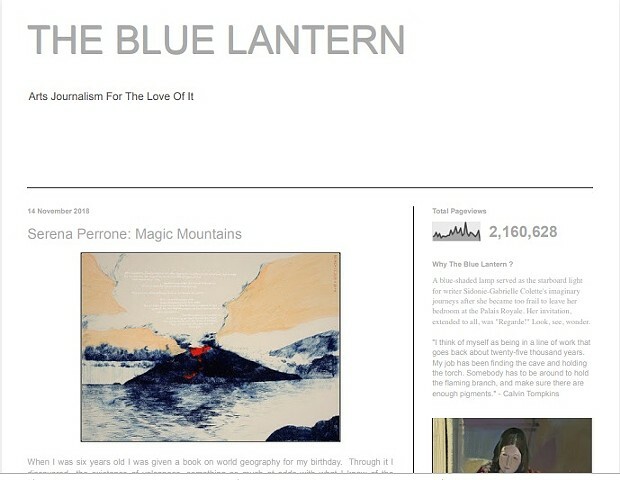 Artblog reviews exhibition On Loan at Tiger Strikes Asteroid, 2012. 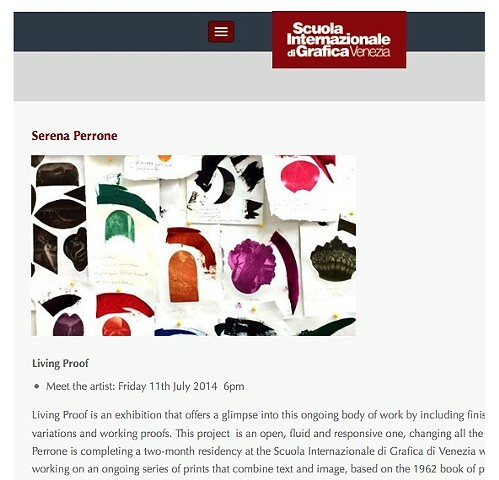 Press release, solo exhibition Living Proof, 2014. 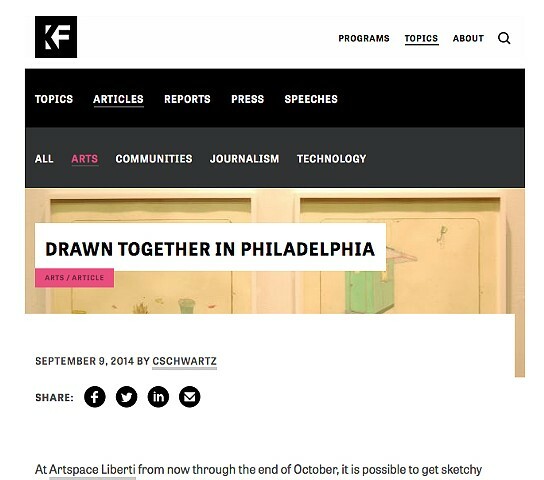 Press release: Drawing Now, 2014. 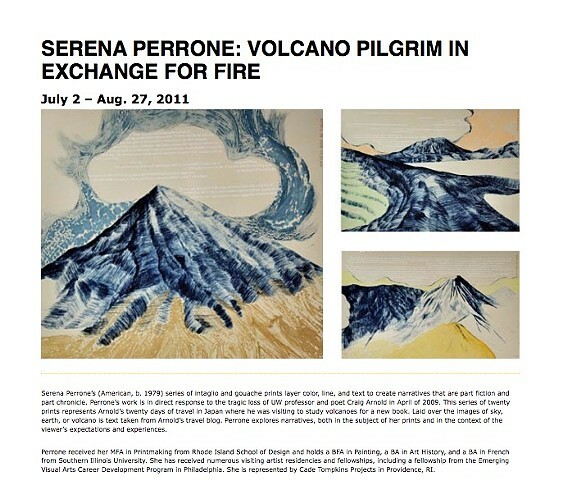 Solo exhibition of A Volcano Pilgrim in Exchange for Fire, University of Wyoming, 2011.
Review of Drawing Now at Artspace Liberti, 2014. 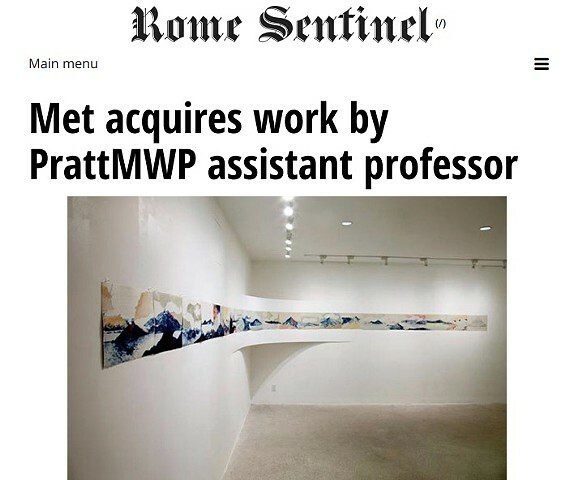 Met acquires work by PrattMWP Assistant Professor, October 2018. 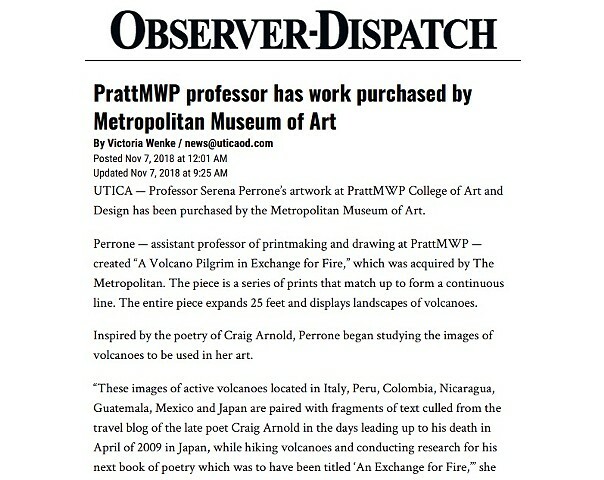 PrattMWP Professor has work purchased by Metropolitan Museum of Art, November 2018. 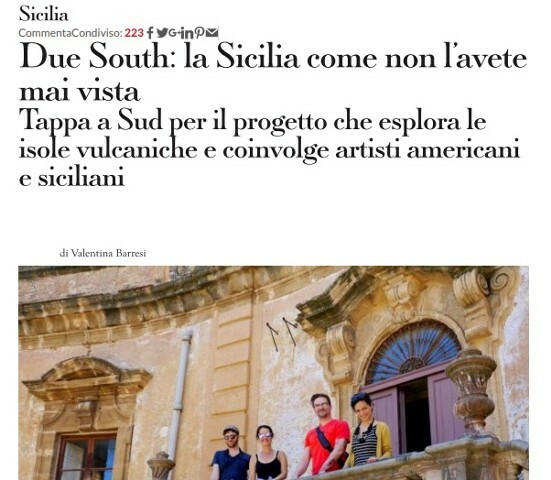 Due South - la Sicilia come non l'avete mai vista. 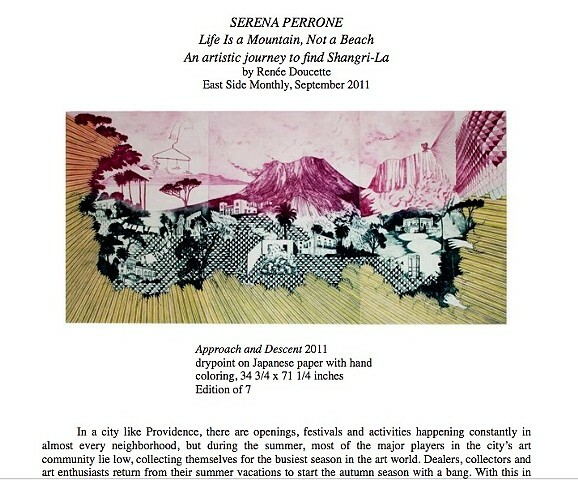 Serena Perrone - Magic Mountains.